The hydrangea macrophylla ‘Zorro’ is a member of the family Hydrangeaceae and can be found in the bed by the fountain. 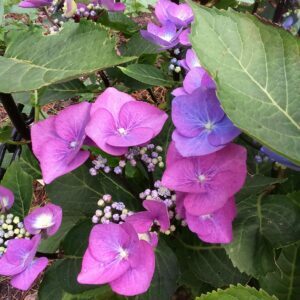 This bushy upright lace cap hydrangea with dark stems has masses of large dark purple blue flowers. Similarly to most hydrangeas, the colour of the flowers can depend on the nature of the soil it is growing in. This particular hydrangea is dark blue in acid soil and rich pink in alkali soil. It eventually reaches one and a half metres in height and will flower throughout the summer. Little if any pruning is needed – remove the old flowers stems in spring and cut back long growth to three sets of buds at the same time. All hydrangeas welcome a moist soil in a cool, semi-shaded area: some of ours suffer where they are too dry. One watering can of rain water can soon put the problem right. To help retain water, we add a good layer of well rotted garden compost to the bed each spring. Hydrangea macrophylla ‘Zorro’ is an Award of Garden Merit (AGM) plant. There are many more hydrangeas in the Gardens – look out for them through the coming months. For example, the Hydrangea aspera, which can be found on Wilson Walk, has velvet-like leaves and flat white and blue flowers. Also keep an eye out for the Hydrangea quercifolia in the autumn when its oak leaf-shaped leaves turn orange.